Welcome to the first I Heart Guitar Theme Week. In the future these will occur in the first week of the month any month when I can think of a theme, but I’m feeling all inspired post-NAMM so I’m going to start now, while I’ve got my Google on. First up is my very own Ibanez Talman TC825, named Candy. You can see the full specs in this Ibanez catalog from 1997. This sparkly beauty was a Christmas present from Mrs I Heart Guitar in 2005. After I almost lost my mind over its magnificence at Music Swop Shop in the Melbourne suburb of Carlton, she asked me a few questions about it, then told me she’d like to buy it for herself so I could teach her to play guitar. But it was all a ruse! I was carrying the guitar out of the store for her when she said “You’d better let me carry that …I can’t make you carry your own Christmas present.” This is just one of the many many reasons I’m totally in love. This particular Talman was produced in Japan at the same Fujigen factory as Jems, high-end RGs, Joe Satriani JS models and other cool stuff like that. 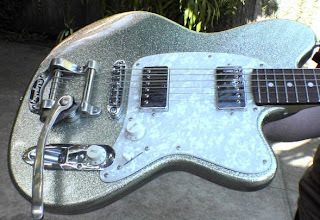 It has two Ibanez Super 58 pickups, 5-way switching (there are single coil and parallel options in addition to the standard humbucker selections) and, coolest of all, a Bigsby tailpiece. The body is alder and the sparkles are magnificent. This guitar is great for edgy overdrive and retro tones, and you can hear it on the song ‘Mistral’ on my myspace. The Talman name lives on in Ibanez’s catalog in the form of various acoustic guitars, but this particular design, sadly, does not. If you can find a used one in good condition, they’re great little players with lots of character. Check back tomorrow for another sparkly guitar! CLICK HERE to see Ibanez Talman guitars on eBay.